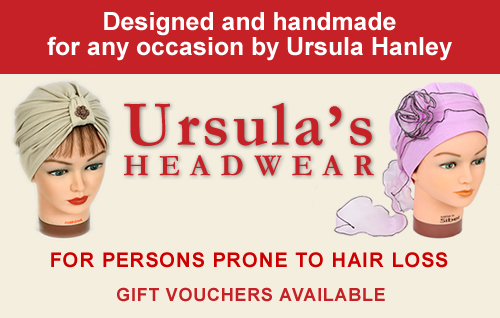 I design and hand make headwear for people prone to hair loss through chemotherapy, Alopecia and other illness. 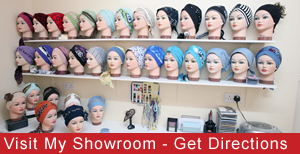 I recognised the great need for comfortable and stylish headwear as an alternative to wearing a wig. My headwear provides total and secure head coverage in fashionable styles. Orders can be placed via email or telephone and mailed out or you may visit my showroom at 37 Beechpark, Athlone for more information or friendly advice please contact me on 086 3899026, 090 6475462 or email hanleyursula@gmail.com. Samples of each style are displayed on the website, however, if you need something extra special for an occasion then please contact me.